The term application is used in this article to refer to either ParishSOFT Family Suite or ParishSOFT Accounting. The phrase annarbor is used in link examples to refer to your diocese or to your independent church portion of your web site address. Select the link for the browser you use to access your ParishSOFT Application. Click the star in upper right corner of the screen (as shown above). You may edit the name associated with this Bookmark as shown in the image (below left). Next save the site to the bookmarks bar (as shown below left) by clicking Done. Each time you open a new window in your Chrome browser, the bookmarks bar will display across the top of the screen just below the address bar, including the ParishSOFT Application link (as shown below right). The taskbar is generally found at the bottom of your screen where icons for your pinned applications as well as your open applications are displayed. While you are on your ParishSOFT Application website, if you select the Settings and more menu button , and select Pin this page to the taskbar, the ParishSOFT Application website icon will be displayed in the taskbar for easy selection. 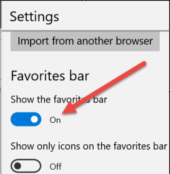 While in Edge with the ParishSOFT Aapplication site displayed, select the Add to favorites button (star); follow the red arrow in the image below. Rename the favorite if you want, and then select Add. 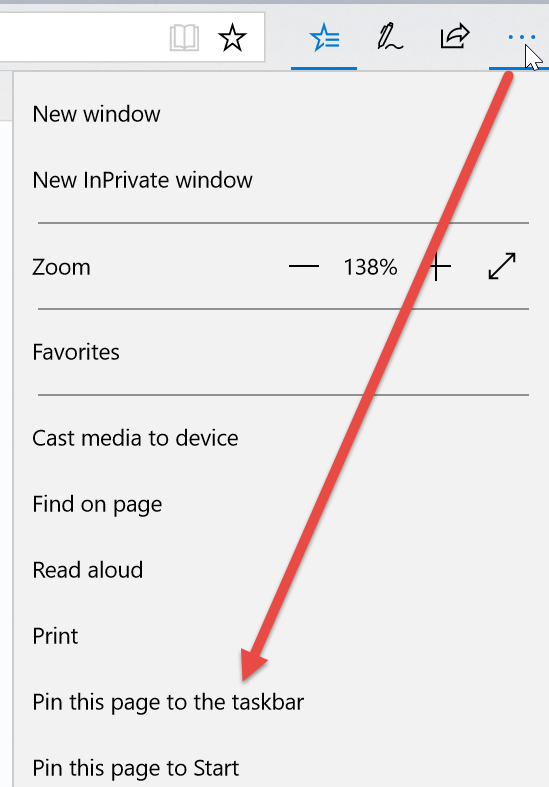 While in Edge, click or tap the Settings and more menu button in the upper right corner of the program. The button is represented by three aligned dots. Under the Favorites bar section, toggle the Show the favorites bar option to the On position. You will then see your new bookmark just under the address bar at the top of the screen. While in Internet Explorer with the ParishSOFT Application site displayed, click the favorites button (star). This will display the Add to favorites drop-down option. Select the carrot to the right. Select the option to Add to Favorites bar from the drop-down. Right click on the favorites star in the upper right corner. A menu will display which will allow you to select which bar tools you would like to display in your browser. The ParishSOFT Application bookmark will now display under the address bar. Select the bookmarks icon . Select the Bookmarks Toolbar Folder. This will display the ParishSOFT Application icon on the Toolbar as shown below. To add ParishSOFT Application to your homepage in Firefox, click into the tab which says ParishSOFT Accounting or ParishSOFT Family Suite and drag it into the house just below. You will then be prompted to make this your new home page. If you select, yes, the next time you bring up Firefox, it will default to the ParishSOFT Application site.